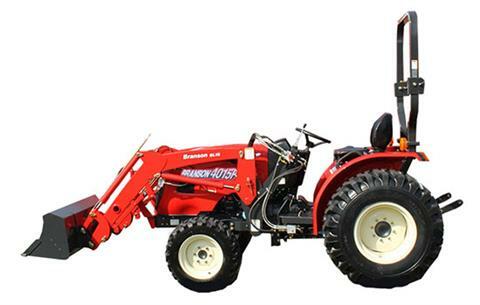 Branson Tractors designed their midsize tractors with rugged, dependability in mind. The company is owned by Kukje Manufacturing of South Korea, a leader in the field of agricultural equipment with over 50 years experience in design, development and manufacture of tractors and other heavy duty agricultural equipment. “A” SERIES DIESEL ENGINE: This series has eco-friendly diesel engines that are built by Branson. They are Tier 4 certified. No intervention or cycling is required from the operator and the operations is fully automatic while the engine is running. An electronic data logger monitors the system, but does not effect the engine’s fuel injection pump. CAST IRON FRAME & STEEL BODY: There is no aluminum, pot metal or brittle metal blends used in the casting of the power train and frame—it’s all CAST IRON. The hoods and fenders are steel with a powder-coated paint finished. The main frame is wide, heavy and reinforced to prevent distortion in rough terrain and heavy duty load applications. These tractors are built to last! FRONT AXLE: Branson’s 4WD axle provides a lock to lock steering angle of 57º with 10º of camber. Since no drag link is used, a smooth, easy and tight turn is achieved. It also reduces front tire wear. Power to the front axel is engaged or disengaged with a small lever. We recommend disengaging the front axle for road use. HYDROSTATIC POWER STEERING: There is no mechanical connection between the steering wheel and the power steering cylinder—it’s all hydraulic. You’ll feel the difference in the smooth and easy turns. DUAL HYDRAULIC PUMPS: This series has independent hydraulic flow to the steering and to the auxiliary, hitch, loader and backhoe functions. LIVE HYDRAULIC POWER: The dual hydraulic pumps are engine mounted and driven by the camshaft gear, giving the operator instant and powerful hydraulic flow. SYNCHRONIZED TRANSMISSION & SHUTTLE: Speed gears are fully synchronized so there is no gear grinding when shifting. A convenient dash mounted control lever shifts smoothly from forward to reverse. The linkage is direct with no U-joints. There are 12 forward & 12 reverse gears. THREE POINT HITCH: The lift capacity is outstanding and is balanced with the dimensions of the tractor. The rockshaft lift arms are a Branson’s exclusive, with a new “yoke” type design, using tubular steel, adjustable, hitch stabilizers—not sway chains. No tools are required for adjustments. A convenient dial knob adjusts the hitch lowering rate for heavier or lighter implements. DIFFERENTIAL LOCK: A pedal operation locks power to both rear wheels for increased traction in heavy, muddy or wet or snowy conditions. Release the pedal or tap the brakes to return to normal use. INDEPENDENT 540 & 540E PTO: The 15 Series tractors use an independent, wet hydraulic, multi disc clutch PTO system. The tractor does not have to be stopped to engage the PTO—it can be done “on the go.” Two PTO speed modes are available. A lever allows selection between 540 and 540E. With ROPS - 104.06 in. On ball ends - 3,306 lb. At 24 in. - 2,420 lb.